Are you waiting for Rajasthan High Court Recruitment Notification 2018-19?? If yes, then here is relevant information for you. High Court of Rajasthan has recently released advertisement for filling up 197 Civil Judge Cadre Vacancies. Applicants who are interested and willing to apply for Rajasthan HC Civil Judge Vacancy may apply through online mode. The online registration form is available from 26.11.2018. Contenders can submit HCRAJ Job Online Form before the last date i.e. 05.01.2019. Rest of information you can collect to read out our full article. Rajasthan High Court Job Notification is published for conducting the examination of Civil Judge Cadre. First, the department will conduct the Preliminary examination to select candidates for Mains Examination. Those candidates qualified Raj High Court Civil Judge Main examination will call for the personal interview round. Furthermore, details such as eligibility criteria, application fees & how to apply for HCRAJ Recruitment 2018? are mention on below segment. Thus the applicants those are willing to apply Rajasthan High Court Vacancy should read fill page properly. Fresh Update as on 14.12.2018: The last date of online registration for Rajasthan HC Recruitment 2018-19 is 05.01.2019. Those candidates have fufilled the eligibility conditions may fill the online form till the last date. Furthermore, you can collect to read out full artticle carefully. Latest News as on 03.12.2018: Dear Applicants, from today you can apply online for Rajasthan High Court Recruitment 2018. The applicants can apply online from 26.11.2018 to 05.01.2019. The direct link is available at the end of the article. How To Check Rajasthan High Court Class 4 Vacancies Application Fees, Pay Scale & Selection Criteria ? How To Fill Online form for Rajasthan High Court Recruitment 2018 – HCRAJ Class 4 Vacancies ? Applicants who wish to apply for Raj High Court Vacancy 2018 must fulfill eligibility criteria also. Candidates must ensure that they are eligible or not for HCRAJ Job 2018-19. It includes details of education qualification, age limit, Required experience & other parameters. Hence, Those applicants are interested in Rajasthan High Court Recruitment 2018-19 must check given below eligibility criteria. Candidates those qualified Bachelor of Laws (Professional) of any university established by law in India are eligible for Rajasthan High Court Vacancy. Applicants also have knowledge of Devnagri Lipi language and Rajasthani Culture. 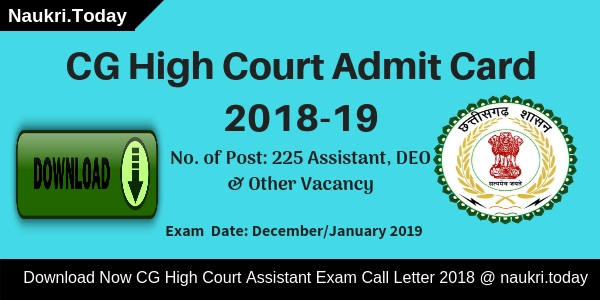 For more information, you can collect from Raj High Court Recruitment Notification 2018-19. The age criteria is decided as on 01.01.2020. 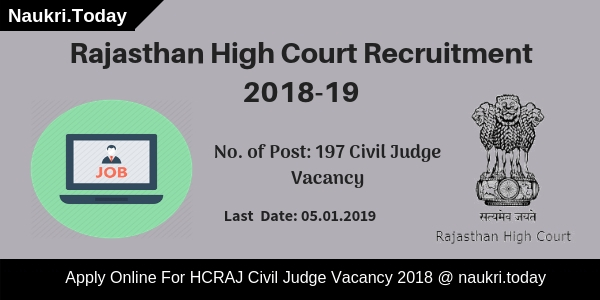 Applicants should be complete 23 years for Rajasthan High Court Recruitment 2018-19. Participants those want to apply for Raj High Court Job should not more than 35 years. Upper age relaxation is applicable as per govt. rules. Furthermore, check Raj High Court Recruitment Notification. To select for HCRAJ Civil Judge Job applicants must qualify all three stages. Applicants selection will be made through this three stages, which is as follows. Participants who are qualified all three stages will select for Raj High Court Civil Judge Vacancy. Details regarding exam pattern & syllabus check HCRAJ Civil Judge Exam Syllabus. Selected candidates for Rajasthan High Court Civil Judge Recruitment will receive Rs. 27700-770-33090-920-40450-1080-44770/- during the probation period. Interested and eligible candidates may apply for Rajasthan HC Recruitment through online mode. Before going to fill up Raj High Court Online Form applicants must keep valid email id and mobile no. Participants also have the scan copy of photograph & signature. Now follow some easy steps to fill up Rajasthan High Court Civil Judge Recruitment Online Form. First of all, go to the official site hcraj.nic.in. Click on the link download Rajasthan High Court Vacancy official advertisement. Now click on Apply Online for HCRAJ Vacancy 2018-19. Enter require information like personal and educational. Upload signature & photograph on your Rajasthan High Court Recruitment Online Form. Now recheck your HCRAJ Civil Judge Job Online Form carefully. Submit Rajasthan High Court Civil Judge Vacancy Application Form. Conclusion: High Court of Rajasthan is inviting online application form for filling up 197 Civil Judge Vacancy. Applicants those are interested and eligible for Rajasthan High Court Recruitment 2018-19 may apply through online mode. The HCRAJ Civil Judge Recruitment Online form available from 26.11.2018 to 05.01.2019. Rajasthan High Court also is known as HCRAJ, has released Rajasthan High Court Recruitment notification for filling up 48 Judicial Judge vacancies. The applicants who want to fill online application for Rajasthan High Court Vacancy can apply from 26 September 2018. Participants who have a degree of Bachelors in Law (Professional) are considered eligible for HCRAJ Jobs 2018. Aspirants will get all the details like eligibility criteria, pay scale, application fee, selection process etc from here. You will also get the official links to download the notification pdf and Apply Online for HCRAJ District Judge Vacancy 2018. Contenders who want to compete for Rajasthan High Court District judge Jobs should satisfy the mentioned education qualification criteria. Applicant should have passed Bachelor’s Degree in Law (Professional) of any University established by Law in India. 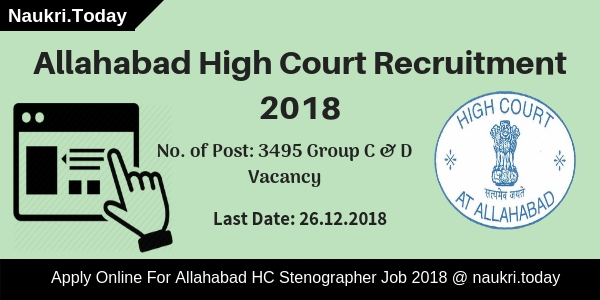 The participant should also have knowledge of Rajasthan Dialects and Social Customs of Rajasthan to apply for HCRAJ Judicial Judge Recruitment 2018. Participants who wish to apply for Raj HC Recruitment should check the age criteria here. The applicant should be minimum 35 years and maximum 45 years old to apply for Rajasthan High Court District Judge Recruitment. Age relaxation will be given to the applicants belonging to S/ST Category and OBC Category for 3 years and 5 years. Candidates who wish to apply for Rajasthan High Court Recruitment need to pay some amount as application fee. You can check below the information given for the registration fee to be paid for Raj HC District Judge Jobs. Rajasthan High court will be selecting eligible candidates on District Judge Vacancy. The participants will be having three-phase selection process i.e. Preliminary Exam, Mains Exam, and Interview. Those candidates who will qualify the Preliminary Exam (Objective Type) will be eligible for the next level that is, Mains Exam which will be Subjective in nature. After this, those who will qualify the two levels will be invited for Interview session for Rajasthan High Court Vacancy 2018. Applicants who will get selected for Rajasthan High Court District Judge Recruitment will get a good amount of salary. The candidates will have the pay band of ₹51550- ₹1230- ₹58930- ₹1380- ₹63070 per month for Raj HC Recruitment 2018. You can go on the official notification for the detailed information for HCRAJ District Judge Vacancy 2018, Links given here. First, visit the official website i.e. hcraj.nic.in. Then, open the “Rajasthan High Court Recruitment 2018” notification pdf. If you are interested and eligible then click on “Apply Online” link. Fill the details in the application form for HCRAJ Vacancy 2018. Upload the scanned Photo & Signature in the form for Rajasthan High Court Jobs. Now, recheck all the details filled in the Raj HC Jobs application form. Now you are supposed to make payment of application fee for HCRAJ District Judge Jobs. After it, you have to click on “Submit” Button. Conclusion: Rajasthan High Court Recruitment 2018 notification is available on its official website for total 48 posts. Applicants can fill the application form through online mode for Rajasthan High Court District Judge Vacancy 2018. The Last date fills the application form for Rajasthan High Court Jobs is 10 October 2018. Are you waiting for Hcraj Class 4 Jobs Notification ??? If yes the here is good news for you. Rajasthan High Court has issued Class 4 Notification for filling up 2309 Peon & Other equivalent Vacancies. All the Job Seeker who are interested in Rajasthan High Court Recruitment 2018 can fill application form though online mode. Closing Date for submit HCRAJ Peon Jobs Online form is 13th March 2018. Rest of the details about Rajasthan High Court Vacancy you can check from below article. RHC Rajasthan is inviting online application for filling 2309 HCRAJ Class 4 Vacancies. This is great job opportunity for all the candidates who are searching Rajasthan High Court Jobs 2018 Notification. Submission of online form for HCRAJ Recruitment will started form 12.02.2018. Candidates who are going to fill online form for Rajasthan HC Vacancies must check required eligibility Criteria. remaining information about Education. age , Selection etc. you can collect by reading the below article. Dear Applicants, in the below section we are providing both Area & District wise HCRAJ Call 4 Vacancies. You can also check these details about Rajasthan High Court vacancies from official notification. Candidates if you are going to fill online form for Rajasthan High Court Vacancies 2018 then read the required eligibility criteria form here. In the below section our naukri.today team is providing education & Age Criteria for HCRAJ Recruitment 2018. You can also get these details from official notification. Candidates must have passed Secondary Examination from any recognized board for Rajasthan HC recruitment 2018. Applicants must have knowledge of Devnagari Lipi & Rajasthan Culture for Hcraj Class 4 Vacancies. Minimum age of the candidates for HCRAJ Recruitment 2018 must be 18 years & upper age should be 35 years as. Relaxation in age for Rajasthan High court Vacancies is applicable up to 05 years for SC/ST category & 03 years for OBC category. For other category you can check from official notification. Selected candidates will paid a good salary for HCRAJ Vacancies on the basis of organization norms. After Joining Candidates will paid Rs. 12,400/- per month for Rajasthan High Court Class 4 Jobs. More information about Rajasthan HC Vacancies Increment & Other allowances you can check from official notification. Candidates of General & OBC Category must paid Rs. 100/- as application fees for Rajasthan High Court Class 4 Vacancies 2018. Other category applicants must paid Rs. 60/- for filling online form for Rajasthan HC Recruitment 2018. Fees must be deposited through online mode only. Selection of the candidates for HCRAJ Vacancies will based on marks obtain in Secondary examination. Merit list will decided the list of selected candidates for Rajasthan High Court Vacancies. Rest of details you can check rom Rajasthan HC Jobs Notification. Interested & eligible candidates for Rajasthan High Court Peon recruitment 2018 must read the below steps. by using these steps you can easily fill online form for HCRAJ Vacancies. First read all steps & Then follow it. First of all candidates log on to the official website www.hcraj.nic.in. Now click on Recruitment section & click on official Rajasthan high Court Jobs Notification link. read all the information mention in HCRAJ Notification. Now deposit application fees & recheck all filled details. Click on submit Rajasthan high Court Recruitment Online form. Conclusion : – Rajasthan High Court Recruitment 2018 Apply For 2309 Class 4 Jobs. candidates can fill online form for Rajasthan high court Jobs on or before the last date 13.03.2018. Check More information about HCRAJ Peon Vacancies by reading the above article.